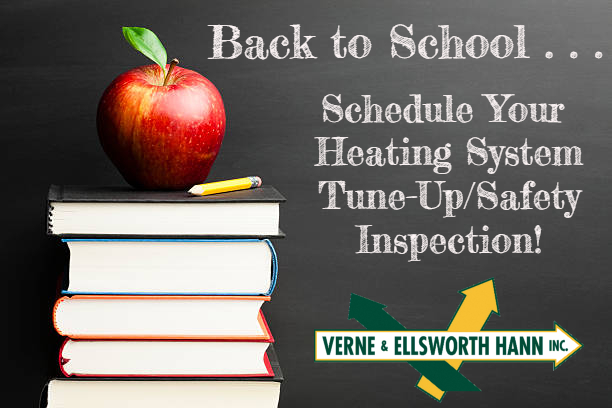 Back to school is a great time to schedule your heating tune-up. It’s hard to believe the kids are going back to school and summer is coming to an end. Soon the leaves will turn, the air will turn brisk, and we will trade in our flip flops for warm boots. It’s certainly hard to let go of long days, the warm weather, and the sunshine that summer brings, but living in Northeast Ohio, it’s inevitable. We try to hold on to the last days of summer as long as we can, and in the process, we tend to not let our minds wonder to the thoughts of the upcoming winter. You certainly don’t want to think about switching your thermostat from “cool” to “heat,” but the truth is, the cold weather will come, and it will be here before you know it. Purchase those school supplies. Buy your children new school clothes. Attend that open house. And make sure to schedule your heating system tune-up/safety inspection! There is no better time to get on Verne & Ellsworth Hann’s schedule. It will insure that your system remains operating at its peak efficiency and maximizes the life of your equipment. Don’t take chances on that first cold day. Let the experts at Verne & Ellsworth Hann maintain your heating system and troubleshoot any issues your system may be having. Let Verne & Ellsworth Hann keep your home warm and comfortable when the cold weather arrives! Whether it’s maintenance, repairs or installations, Verne & Ellsworth Hann has your heating needs covered! Located in Cleveland Heights and owned and operated by brothers Bill and Chris Hann, Verne & Ellsworth Hann is a 5-generation company. Servicing the Heights area and Northeast Ohio for over 63 years, Verne & Ellsworth Hann is the ONLY Hann family owned heating, cooling and plumbing company in Cleveland!